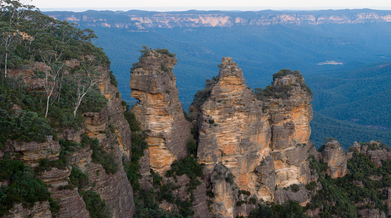 The Royal National Park, 30 kilometres (18 miles) south of Sydney, is the world’s second oldest national park. It has spectacular coastal beaches, bush and biking tracks, and calm swimming holes. The Royal National Park was originally known simply as National Park, the park gained the Royal name in 1955, recognising Queen Elizabeth II’s visit to Australia the prior year, when she passed through the area on a Wollongong to Sydney train. Park entry costs $12 AUD per vehicle per day. The Royal National Park is home to 11 beaches, counting the surfing hot spot of Garie Beach, guarded by surf lifeguards in summer. There are calmer conditions at the large sand spit near Bundeena’s Bonnie Vale campground, and nearby Jibbon Beach is a family-friendly swimming spot. Wattamolla Beach, halfway along the coast, has a large area of sand that’s suited to playing beach volleyball. For a freshwater dip, try Karloo Pool or Deer Pool. The park is home to the historic Audley Boatshed, established in 1893. Hire a rowboat, canoe or kayak for an hour or for the day and explore the upper reaches of the Hacking River and Kangaroo Creek. The boatshed also has child-friendly aquabikes and mountain bikes for hire. The boatshed is open every day, including Christmas Day! You can walk there from the tram station near the park visitors centre. Sydney Tramway Museum’s antique trams run from a spot near Loftus railway station (in south Sydney) into the park on Wednesdays and Sundays. Why not take a hike along the coastal track from Bundeena to Otford between May and November? there’s every chance of catching sight of passing whales. They’ll be following what’s known as Australia’s Humpback Highway as they migrate between their feeding and breeding grounds. Pack a pair of binoculars for an improved view of their antics, which can consist of remarkable leaps from the water and fin slapping. Bushwalkers can cross more than 100 kilometres (62 miles) of park tracks. Take a break at the spectacular Unrecurring waterfall. For a relaxed stroll featuring native plants and flowers, take the Forest Path loop. Take your bike and hit the park’s cycling trails. The 10-kilometre (6 mile) Loftus Loop Trail ranges from smooth, widespread trails to steep single track that will get the heart pumping. Lady Carrington Drive is a one-way cycle that touches a historic carriage route alongside the Hacking River. It takes cyclists over 15 creeks and through areas of rainforest. If you love waking up to the sounds of birdsong, surrounded by nature, then spend the night in the national park! Options range from the Bonnie Vale campground at the town of Bundeena to more luxurious options such as the heritage Hilltop Cottage, which accommodates for six guests; Reids Flat Cottage which houses eight; or Weemalah Cottage, which sleeps six in a private riverside location. If you’re up and about in Australia and are thinking of more activities to do and places to check out then why not take a look at this guide on the 100 best things to do in Australia? You can find out more on RV Lifestyle’s blog here.